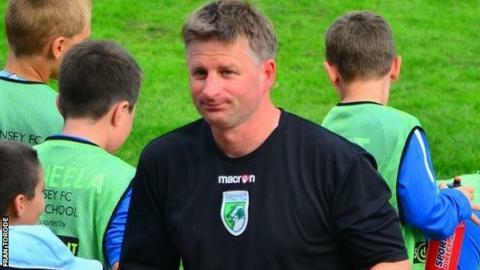 Guernsey FC manager Tony Vance says his defensive tactics are not working. The Green Lions have lost six of their last seven league games, conceding 31 goals in the process. "'Park the bus' is a famous comment but, do you know what, funnily enough, we've tried that for the last three months," Vance told BBC Radio Guernsey. "The tactics have been to try and stay in the game. The tactics have been to try and defend solidly and hit teams on the counter." Guernsey have suffered a and their second-worst loss, in the past three games. "We're in a bad situation at the moment," said Vance. "People have bad days at work where they might cost their companies money - we're having bad days at the office at the moment. "We've got to try and find a way of getting out of this. How do we do it? We've just got to work harder." Guernsey, who are 18th in Isthmian League Division One South, travel to fifth-placed Whyteleafe on Saturday. Vance says his side are struggling for momentum, as his midweek away line-ups are vastly different from his weekend teams with many of his squad unable to travel off the island due to work commitments. "Football is a morale game and a confidence game and a momentum game, so if we get a win on Saturday everybody will be happy," he said. "But I know pretty much come Tuesday night we'll have a completely different team, different players, we're going to have completely different tactics. "We haven't had the same back four for about 12 months so it's going to be hard. "I know we have our backs to the wall and we'll struggle to get a result, so every time we have a positive result we get another negative. "That's what unfortunately we have to try and deal with, we've got to try and get that momentum from somewhere."